Last year's poll ended in a nail-biter between eventual winner The Departed and scrappy underdog Children Of Men, but there was no such suspense this year. 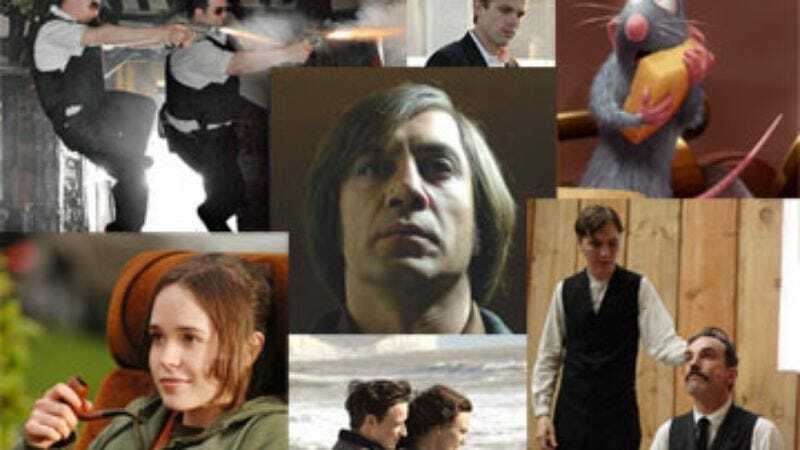 Many of you agreed with our assertion that 2007 was a particularly strong year for movies, but even given that, the Coen brothers' No Country For Old Men dominated the field, appearing on nearly 70 percent of the ballots. It's possible that There Will Be Blood might have presented a stiffer challenge if more voters had a chance to see it before deadline, just as Pan's Labyrinth would have fared better had it not rolled out just as slowly last year. But even that seems unlikely when you consider that No Country scored a whopping four points per ballot, which means it averaged a second-place finish. Still, No Country's triumph was predictable (even if the margin of victory wasn't), since the film more or less swept the critics' guild awards, and leads this year's Oscar race, with eight nominations. So what was unexpected? For me, the big surprise was Hot Fuzz, which didn't appear on any A.V. Club Top 10s—not that we didn't love it, mind—but which leapfrogged all the way to #4 until late-breaking ballots knocked it down to a respectable #7. Based on the comments, many found it the most purely entertaining film of 2007—or, as reader Ed Robertson put it, the movie he'd most likely steal from his roommate's DVD collection. Other surprises: A Ben Affleck-directed film sneaking into the Top 10 (thus confusing many who thought they had him pegged), The Darjeeling Limited defying the lukewarm critical consensus to land at #9, and Superbad soundly thumping the more heralded Knocked Up for Judd Apatow comedy supremacy. But that's enough from me, since this poll is all about you. A few more notes before I go: First and foremost, thanks greatly to everyone who participated, especially those who took the time and effort to share their thoughts on the year in film. The number of ballots increased sharply over last year's total, which tested the limits of what I can compile on my own (future interns: prepare for action! ), but also offered an embarrassment of riches. As a result, some very good comments were left on the cutting-room floor, so don't despair if yours didn't make the final edit. Thousands of finely crafted words were slashed from this already-unwieldy piece, and it was painful work getting it done. And finally, we promised prizes for our three favorite contributors, so congratulations to Stephen Parkhurst, Greg Burland, and Jordan Miller. We'll be in touch soon about sending the A.V. Club T-shirts and other assorted miscellany you so richly deserve.